When a new version of JungleDocs is released and you still have an active subscription you can easily upgrade. We will notify you via email once a new version is available. Always make sure you have downloaded the latest version. You can use the download link that was provided to you by EnovaPoint to download the latest version anytime. If you lost the download link, you can request another trial anytime. 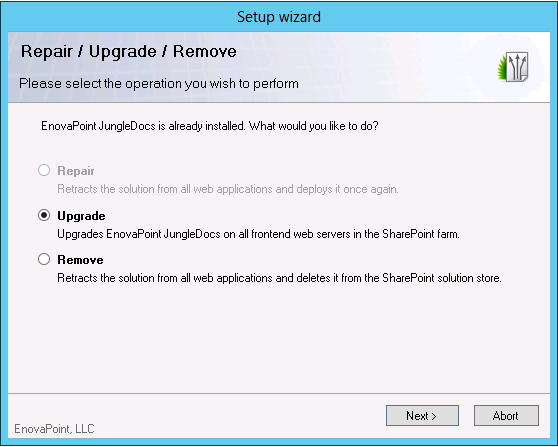 Launch JungleDocs Installer from SharePoint Server running Central Administration Service. The product will be automatically deployed to all other SharePoint Farm servers by the SharePoint Timer service. Note: installation may cause 2-5 minutes of downtime. Wait for setup wizard to check if JungleDocs can be installed from the current machine. Wait for setup wizard to check if JungleDocs is already installed. Make sure there were no errors and close the setup wizard. Do IISReset on all servers in your farm. Restart SharePoint Timer Service on all servers in your farm. Run the setup program again. Follow the installation wizard instructions and choose the Repair option. When the installation is complete, review the summary screen to confirm that the product installed successfully, and then click Close. Note: if you are upgrading from an earlier version to JungleDocs 3, your JungleDocs rules will not be preserved. All of your content types and document templates, however, will still be intact.